It is a matter of great concern that much of the Church adopts a consistently hostile position on Israel and supports (Muslim) terrorist organisations that are committed to Israel’s destruction and to general anti-Semitism. Much of the worrying opinion in Church pronouncements can be traced back to churches buying in opinion from the WCC instead of forming an opinion from study of scripture and History. One example is Britain’s Baptist Union (BUGB). The World Council of Churches claims to speak for over three hundred and forty denominational bodies within the universal church of Christ, representing about 550 million Christians in more than one hundred and twenty countries. Yet, why would churches accept unquestioningly that an august sounding body is actually propagating God’s opinion? Are churches building theology upon the politics of man? The banner under which WCC operates is the Greek word oikoumene (literally, "inhabited world"), which is prominently displayed in its logo; its website is oikoumene.org. Yet the World Council of Churches is far from loyal to traditional Christian theology. It concentrates on socioeconomic issues and ecology, believes in redistribution of wealth, and is overtly pro-Palestinian. In its early years, it operated on the basis of a Christocentric-universalism: Everyone will go to heaven based on Christ's atoning work. Then, in the mid-1990s, under the leadership of General Secretary Konrad Raiser, it moved even farther from biblical doctrine to a more pluralistic form of universalism. In other words, the WCC likes to think of the world as one enormous family and itself as helping that family socially and economically. Ecumenism historically rallied around "oneness" as it related to churches and Christian witness in the world. Now, however, the WCC embraces "the unity of God's whole creation and recognizes every human pursuit as subject to the healing ministry of Christ's Spirit." Consequently, social and political activism have become the matrix of the organization's identity. The WCC now describes witness as "speaking] out with a strong voice to promote peace, justice and care for God's creation"' and working to "challenge each other on how to bear witness to Jesus Christ in all realms of life-personal, cultural and socioeconomic." Under the umbrella of the AGAPE (Alternative Globalization Addressing Peoples and Earth) reference group on Poverty, Wealth and Ecology (PWE), the World Council of Churches promotes programs to repair the disparity between wealth and poverty. In other words, it promotes redistribution of wealth. According to the WCC, the "agroindustrial-economic complex" of the "global North" is primarily responsible for the planet's perceived economic and environmental crises. Paul C. Merkley, Professor Emeritus of History, Carleton University, Ottawa, Canada has studied the WCC, and its forerunners back to the 1930s. (Bodies that represented roughly the same constituency the WCC claims to speak for today) He has observed that they have a worrying track record of being wrong about politics and national leaders. They were wrong about Hitler and Mussolini, whom they judged to be sober-minded statesmen intent on bringing self-respect to their abused people. They were wrong about the prospects for peace, preferring to believe that a loving attitude towards the grievances of the soft-spoken Adolf Hitler would make it unnecessary — indeed, criminally irresponsible, to prepare for war. They lionized Chamberlain, and loathed the war-monger Churchill. They were silent on the issue of Hitler's persecution of the Jews, opposed to Zionism, and vocal in support of British restrictions on further Jewish emigration to Palestine in 1939. They opposed relaxation of the existing immigration laws which prevented the influx to America and Canada of the hundreds of thousands of Jews fleeing for their lives from lands occupied by Hitler. Peace Delegation after Peace Delegation went to Germany and then came back to Britain and to America with praise for the modesty and temperance of Adolf Hitler. Throughout the Cold War period, in this same appeasing spirit, the WCC refrained from complaint on behalf of the persecuted Christians in the Communist world. Today, the WCC has not learned from past error about Adolf Hitler, whom they found to be genial. Today they find Ahmadinejad and Nasrallah to be genial company. A group of leaders of the National Council of Churches of Christ (the American branch of WCC) visited President Mahmoud Ahmadinejad in Tehran in March of 2007. They reported back that "Ahmadinejad comes across as a very religious man" — who would want to deny that? — a man furthermore, "having a measured tone, seemingly reasonable and having a witty personality." "Those who think they can revive the stinking corpse of the usurping and fake Israeli regime by throwing a birthday party are seriously mistaken.... Israel is on its way to annihilation .... [and] has reached the end like a dead rat." In October of 2004, a delegation of senior American Presbyterian leaders went to Lebanon in order to meet with the leaders of Hezbollah. Among Hezbollah's other active daily pursuits is intimidation of the Christian population of Lebanon, for the purpose of encouraging them all to depart forever. It is the appeasing spirit that inspires the fixed policy today of the WCC to refrain from reference to persecution of Christians in Muslim lands. WCC went over to the side of the "Palestinian national struggle" in 1967 and has become increasingly blatant in expression of its basic contempt for Israel ever since. The National Council of Churches in the U.S.A (NCCUSA), the Canadian Council of Churches (CCC), and the many denominational bodies that publish journals and newsletters for their members, all take their editorial line on Israel/Palestine wholesale from the same source; the World Council of Churches. 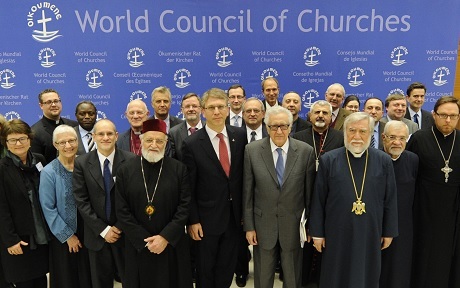 The WCC, in turn, takes its rhetoric from the Middle East Council of Churches (MECC). A trained ear quickly picks up the recurring phrases: "standing with the Palestinian people in their struggle," "oppressive and illegal occupation," references to the armed forces of nations as "instruments of terror," references to Palestinian Christians as "living stones," victims of the "contemporary Herod." WCC statements seek to ignore the very existence of the State of Israel, preferring to speak of "Occupied Palestine and Israel (OPI)." In May of 2008, at the time of the Fiftieth Anniversary of the creation of the State of Israel, the World Council of Churches chose to express its contempt for Israel by turning its back to the people of Israel, instead organizing events in commemoration of the Nakba, the Catastrophe. But why does the WCC form anti-Israel opinions and propagate them to the Church worldwide? This has to be a matter of conjecture. Let us ask some questions. Why would you expect it to do otherwise? Does God impart revelation through Councils and committees of men? Councils of men, generally speaking, are discussion forums, at which the views of the elected (or un-elected) representatives discuss their opinions and form a consensus and publish policy statements, directives or whatever. Consider the errors that much of the church brings to council meetings. See Anti-Semitism and Church History. Consider the bad theologies that are still held by leaders and academics. Let us speculate on the makeup of council meetings. How many ordinary, simple Bible believers? How many career and political churchmen, academics? How many Jews and Israelis? How many Christian Zionists? How many Liberal, socialist and politically correct? How many born again, Spirit filled Christians? How many cultural Christians? Is it any wonder that the output of the WCC is anti-Semitic; even though it is cloaked as anti-Zionist in order to pander to political correctness and world acceptability? More specifically, how is WCC informed on Holy Land matters? One could ask the same question about the makeup of the MECC; especially about the balance of Israelis and Arabs. The following comments do not apply to all Arab Christians. However, born again, evangelical Christians who believe God has not rejected Israel are an intimidated minority in the Middle East. We are acquainted with one Arab pastor who has been shot and left for dead for his beliefs and who's church has been firebombed more than once. We need to ponder the theological and political position of MECC members. Many prominent church leaders in Muslim lands adopt a political, appeasing attitude to Muslim persecutors in the hope of protecting their flocks, their positions or their own skins from Muslim attacks. This does not appear to be effective! In Bethlehem, for example, even though Muslim persecution and harassment of the Christians has reduced the Christian population from something like a 60% majority to a 10% minority, those who claim to speak for Arab Christians usually concentrate on blaming the Israelis and avoid mentioning Muslim persecution. The fear is obvious! Christian mothers have to cope with pressure from Muslim neighbours asking why their sons are not signing up to be shahada to fight Israel! Palestinian leadership, be it the supposedly moderate Fatah of Mahmoud Abbas in the West Bank, or the hard-line Islamic regime of Hamas in Gaza is brutal in its enforcement of the anti-Israel policy. Offences such as co-operating with Israel or selling land or property to Jews are treated as capital crimes. Enforcement can be really arbitrary and brutal, so ordinary citizens have to tread with great care. "Co-operation with Israel" could be defined in many ways. The theology of many Middle Eastern, Arab, churches is strongly influenced by Replacement Theology and Liberation Theology. One prominent, influential Arab Christian organisation in this mould is Sabeel. Sabeel is beloved of western academic, liberal, anti-Israel ecumenical groups, and its views contribute to church Anti-Semitism. Then there is the Ecumenical Accompaniment Programme in Palestine and Israel (EAPPI). EAPPI is a program supported and funded by the Geneva-based World Council of Churches, a major supporter of the anti-Israel divestment campaign. According to NGO Monitor, EAPPI policies reflect a radically pro-Palestinian agenda, presenting a biased Palestinian narrative and failing to make any mention of Palestinian terror or the human rights of Israelis. In fact, the principal agenda of EAPPI includes the Ecumenical Campaign to End the Illegal Occupation of Palestine. Since the EAPPI program was launched in August 2002, 198 activists have participated from more than 30 churches and ecumenical partners in 12 countries. According to NGO Monitor most of these activists, upon returning to their home countries, become active in anti-Israel campaigns. The greater point of dispute lies in the goal behind EAPPI and the World Council of Churches. According to the EAPPI website, the NGO was launched "to end the illegal occupation of Palestine and support a just peace in the Middle East." Does EAPPI believe that a just peace entails a Jewish state of Israel who has every democratic right to protect and defend her citizens? It appears not. In your town or village? The vicar of a local village (in Herefordshire) took a group of parishioners to Israel (or whatever they call Israel) and brought them back; all violently anti-Israel. How can the church be engaged in such malice and indoctrination? Is the problem actually fundamental ?